A lovely blend of double flowers on tall stems. Ideal for borders and cutting. Very easy to grow and a traditional 'cottage garden' favourite. Attracts butterflies and bees. 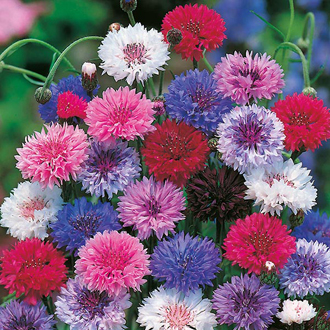 Sow outdoors, March-May or August-October, where they are to flower, 0.5cm (¼") deep, directly into finely-prepared, well-drained soil, which has already been watered. Seedlings usually appear in 14-28 days. Thin seedlings to 20cm (8") apart. Water well until plants are established. For a continuous display, make sowings at two to three-week intervals. Sowings made in curves, rather than straight lines, often create a more pleasing effect. Flowers: June-September. Late summer and autumn sowings will flower the following year, often earlier than spring sowings. Remove dead heads to prolong flowering season. Why not grow some in the vegetable garden, just for cutting?